Right now this Kasidy Thinsulate Comforter Mini Set is $39.99 (Retail $131.58). The Thinsulate Comforter Mini Set is the perfect casual update to any room. 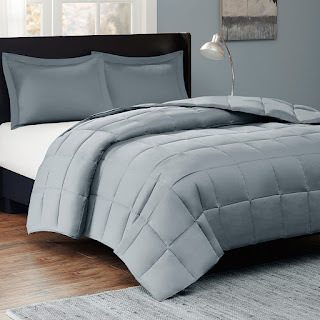 The comforter features a soft 300 thread count cotton sateen and end to end box quilting to prevent the fill from shifting, providing an even layer of warmth and comfort. It's filled with 3M featherless fiber. This revolutionary, loose down alternative fill mimics or surpasses the performance of natural down in fill power, loft and overall performance. Made of durable, lightweight polyester fibers, 3M Thinsulate Featherless Insulation provides warmth without a single feather. It's also hypoallergenic leaving you worry free from allergies. Ends 3/20 or while supplies last.